When will I get my order? : Orders are processed in 3 business days. Then refer to this map (Click here for map) to calculate the additional shipping time. Your favors ship from NY. 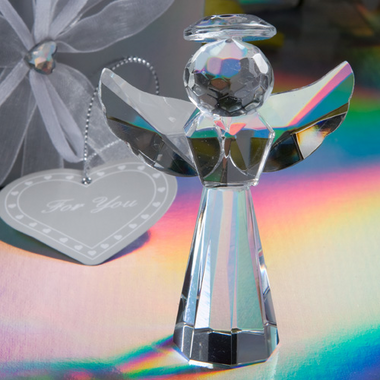 Our angel crystal Communion favors will be a heavenly favor for all of your guests. Angels symbolize faith and crystal lasts a lifetime. So giving crystal Communion angel favors will allow you to share your love and lasting faith with others. Each First Holy Communion angel favor measures 3" x 2 1/8" and is made of brilliant multi-faceted crystal in the shape of a beautiful angel with outstretched wings and a glistening halo. Favors come packaged surrounded by white satin inside a silver box decorated with white hearts, wrapped with an organza and satin bow with a crystal heart accent on top and an attached matching heart shaped "For You" tag.